The 12 Inch Minnie Bow-Tique Bike is an ideal first bike. The steel front basket features cute Minnie Mouse graphics and has lots of room for toys and accessories. Kids can even bring their favourite doll or plush toy along for the ride in the pink doll carrier on the back, keeping them secure with the safety strap. The 12 Inch Minnie Bow-Tique Bike features a fully enclosed plastic chain guard to protect little fingers. The chain guard is printed with fun images of Minnie Mouse and Daisy Duck on a white floral background. These graphics are continued on the strong and durable pink steel frame. The comfortable saddle is printed with a pretty polka-dot design that Minnie fans are sure to love. 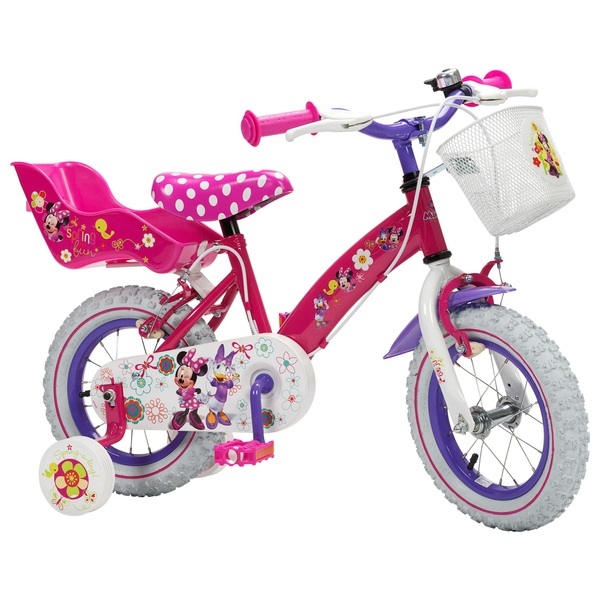 Removable stabilisers with a cute flower and bird print are included with the 12 Inch Minnie Bow-Tique Bike. These will help your child to develop the balance and coordination they’ll need to cycle unaided. The stabilisers are easy to remove once your child is ready to cycle without their supprt. The 12 Inch Minnie Bow-Tique Bike is equipped with a fixed gear, purple steel rims with air pumped tyres, front and rear caliper brakes for the safety of the cyclist and a front mudguard that protects the rider from splashes while cycling.